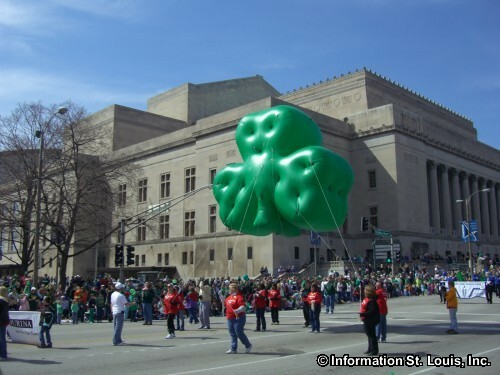 The St. Patrick's Day Parade is recognized as one of the top St. Patrick's Day parades in the country and is one of the largest annual events held in downtown St. Louis. There are floats, marching bands, large balloon floats, clowns and lots of Irish dancers! Leprechaun Village, located near the starting point of the parade in Aloe Plaza, is a family-friendly area where kids of all ages will enjoy watching the helium character balloons get inflated and Irish themed entertainment. It opens at 9am. Parade goers can also visit the Irish Village at Ballpark Village before and after the parade for food and live entertainment. The parade begins at 12pm at 20th and Market and runs the length of Market Street to Broadway and ends at Ballpark Village at Clark and Broadway. Rain or Shine. See website for more information. Market Street is located in downtown St. Louis. It begins at Memorial Drive, just west of the Gateway Arch, and runs west to then end at Compton. Located along its length are many of the City's attractions such as the Old Courthouse, Kiener Plaza and the entire Gateway Mall with CityPark, Aloe Plaza, Serra Sculpture Park and several other small green spaces; St. Louis City Hall, the Peabody Opera House and Union Station. Market Street is also the location of many of the City's annual parades. The St. Patrick's Day Parade, the Veteran's Day Parade, the Thanksgiving Day Parade, the Veiled Prophet Parade and the Labor Day Parade all travel down Market Street. Directions: Market Street can be reached by Tucker Blvd, Broadway, 4th, 14th, 16th and others in the City. And from Interstate 64/40 from the east by taking Exit #40A onto 9th Street and continue to Market Street. From the west take Exit #38A onto Jefferson Avenue and turn left onto Jefferson and then right onto Market Street.